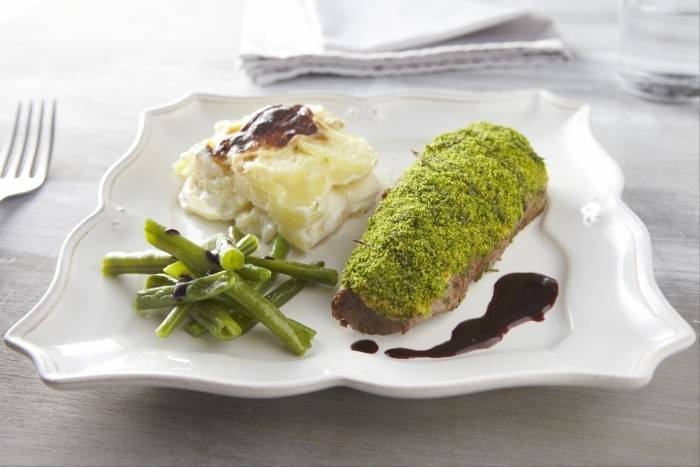 Rump of lamb with a rosemary and garlic crust, served with creamy gratin dauphinoise and a red wine sauce. Peel the potatoes and use a mandolin to cut them into 3mm thick slices. Score the fat on the lamb rumps in a criss cross pattern. Transfer to the oven and cook for 15 minutes. For the beans: Top and tail the beans. Bring a pan of water to the boil and add a generous amount of salt. Cook the beans for 3 minutes in the rapidly boiling water and then drain. Season with salt and pepper and serve with a knob of butter. Slice the rump into 5 slices. Season with salt and pepper. Serve with a neat pile of green beans and a large spoon of gratin dauphinoise. Finish with the red wine sauce.